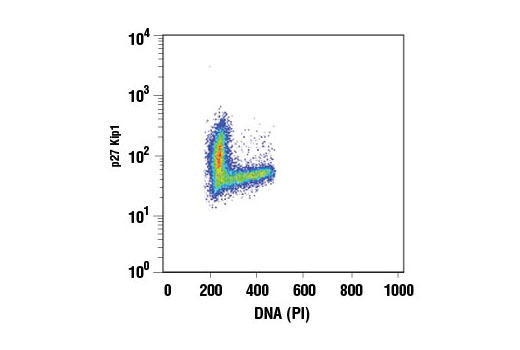 Western blot analysis of extracts from various cell types using p27 Kip1 (D69C12) XP® Rabbit mAb. 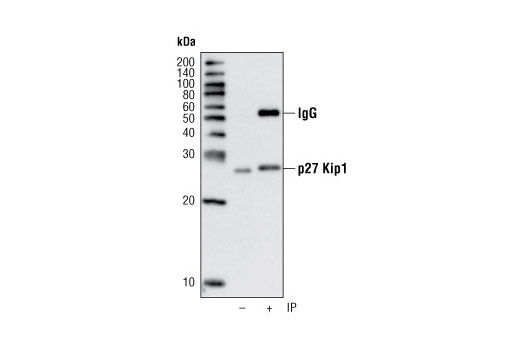 Immunoprecipitation of p27 Kip1 from 293 cells using p27 Kip1 (D69C12) XP® Rabbit mAb. Western analysis was performed using the same antibody. Lane 1 is 5% input. Confocal immunofluorescent analysis of MCF-7 cells using p27 Kip1 (D69C12) XP® Rabbit mAb (green). Actin filaments have been labeled with DY-554 phalloidin (red). Flow cytometric analysis of Jurkat cells using p27 Kip1 (D69C12) XP® Rabbit mAb versus Propidium Iodide (PI)/RNase Staining Solution #4087. Anti-rabbit IgG (H+L), F(ab')2 Fragment (Alexa Fluor® 488 Conjugate) #4412 was used as a secondary antibody. 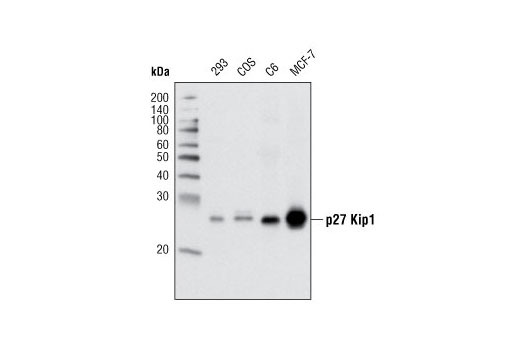 p27 Kip1 (D69C12) XP® Rabbit mAb detects endogenous levels of total p27 Kip1 protein. 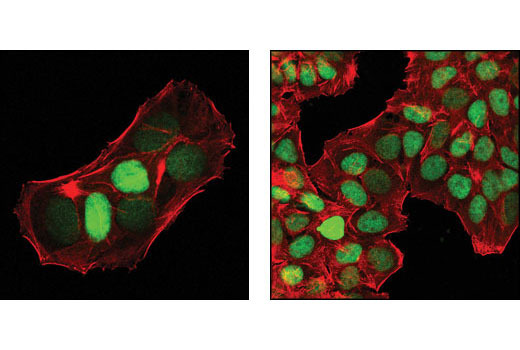 Monoclonal antibody is produced by immunizing animals with a synthetic peptide corresponding to residues near the amino terminus of human p27 Kip1.